Minister of Foreign Affairs and Foreign Trade, Senator the Hon. A.J. Nicholson (fourth left); State Minister for Foreign Affairs and Foreign Trade, Hon. 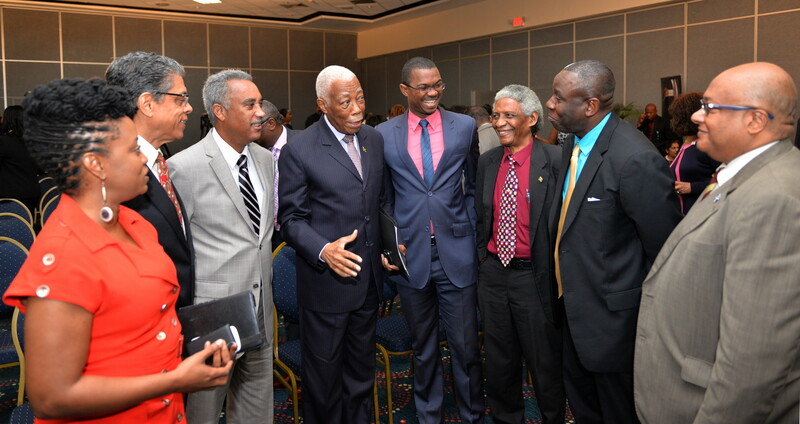 Arnaldo Brown (fourth right), and Permanent Secretary in the Ministry, Ambassador Paul Robotham (third left); having a light exchange with members of the Conference Preparatory Committee (from left): Project Manager, Conference Logistics and Preparations, Lisa-Ann Ogilvie; Chairman, Conference Preparatory Committee and President and Chief Executive Officer, Victoria Mutual Group, Richard Powell; Chair, Programme and Content Sub-Committee and Executive Director, Jamaica Diaspora Institute, Professor Neville Ying; Senior Vice President, Operations and Marketing, GraceKennedy Money Services, Noel Greenland; and Chair, Logistics Sub-Committee, Commissioner of Customs, Major Richard Reese, at the launch of the 6th Biennial Jamaica Diaspora Conference, held at the Jamaica Pegasus Hotel in New Kingston on February 20. The 6th Biennial Jamaica Diaspora Conference, to be held at the Montego Bay Convention Centre, in St. James, from June 13 to 18, is being positioned as a global forum to mobilise Jamaicans worldwide. Prime Minister, the Most Hon. Portia Simpson Miller, said the scope of the conference is being broadened with the vision to attract members of the Diaspora outside of the traditional areas of the United Kingdom, the United States and Canada. The Prime Minister noted that the Diaspora has contributed over US$10 million to the health and education sectors over the three-year period ending in 2014. “We are cognisant of the fact that Jamaicans reside in every corner of the globe; therefore, broadening the scope of the conference is a step in the right direction,” she said. The Prime Minister made the remarks in a speech read by Minister of Foreign Affairs and Foreign Trade, Senator the Hon. A.J. Nicholson, at the launch of the 2015 Conference at the Jamaica Pegasus Hotel in New Kingston, on February 20. “This approach allows us to come together to chart the way forward for the growth and prosperity of this blessed nation. It also sets the stage for our discussions to be translated into action,” she said. Meanwhile, Mrs. Simpson Miller lauded the Diaspora for its unyielding support to Jamaica, pointing out that her administration continues to recognise the importance of the movement to the country’s development. Also, an estimated 132 healthcare groups send an average of 200 medical missions from the Diaspora to Jamaica each year, she informed. “Diaspora groups have also made meaningful contributions to hospitals, health centres, schools and other educational institutions. In addition, the Diaspora education and healthcare interest groups have developed a collaborative framework with several Ministries,” the Prime Minister pointed out. She noted that in recognition of the Diaspora’s contributions and importance, the Government has developed a number of initiatives in an effort to reintegrate members of the Jamaican family currently living overseas. Mrs. Simpson Miller said the initiatives, which include the establishment of the Jamaican Diaspora Foundation and the Jamaica Diaspora Institute, are all aimed at raising the level of engagement with the Diaspora. In his remarks, State Minister for Foreign Affairs and Foreign Trade, Hon. Arnaldo Brown, said the 2015 Biennial Conference will take place within the context of the Government’s efforts to spur economic growth, job creation, employment and social development. Mr. Brown, who has responsibility for the Diaspora, said these efforts are being made within a framework where the Government is seeking to harmonize the requirements of the current International Monetary Fund (IMF) Extended Fund Facility, the core goals of Vision 2030, and the Medium Term Economic priority areas. “In this regard, Jamaica and its Diaspora need to collaborate to achieve short-term, medium-term, and long-term objectives for growth, development and prosperity,” he argued. In the meantime, Mr. Brown said this year’s programme has been shaped to give greater emphasis to the mutual benefits to Jamaica and its Diaspora and to expand the global reach of the Diaspora consistent with the new Diaspora policy that is being developed. He further informed that there will be two focal areas for this year’s forum, which are investment and trade and social services. Key areas of focus will include education, health, and the creative industries. Mr. Brown said the expected outcomes include expressions of interest; commitment for specific investment; equity investment through the main and junior markets of the Jamaica Stock Exchange; and human capital utilising Diaspora skills and expertise for major projects for economic growth and job creation. The 2015 Diaspora Conference is being held under the theme: ‘Jamaica and the Diaspora: Linking for Growth and Prosperity’. Signature features will include the ‘Marketplace Exposition’, featuring a range of local businesses and brands from various sectors, and the ‘Government at Your Service’, which is a collaboration of public sector agencies offering attendees fast-tracked government services. The ‘Diaspora Day of Service’ has been significantly broadened in scope in an effort to encourage civic-minded Jamaicans to offer their time, skills and resources to various community projects.